A country of sea, mountains and green valleys, the Republic of Lebanon overlooks the eastern Mediterranean along 223 kilometers of coastline from south to north, and a width eastwards to the Syrian border that varies between 40 and 75 kilometers. The narrow coastal plain, where cities and towns succeed one another, quickly climbs Lebanon mountain range, whose summits, snow-covered in the winter, reach up to 3,000 meters. Its slopes are carpeted by the famous cedar tree, symbol of the country. After this first mountain range, the Bekaa depression lies down, planted with orchards and vineyards, and overlooked on the east by the tops of another mountain range, the Anti-Lebanon. This geographical mark of intimate proximity between sea and mountains has shaped up this corner of the Middle East’s history. The magnificent Mediterranean seaboard involved exchanges, and a vocation as a bond between East and West never disrupted since the Phoenician times. Throughout history, both mountains and valleys have served as a refuge for many religious minorities, so that Lebanon is today a mosaic that is home to 5 recognized Islam branches (Sunni, Shiites, Alawites, Druze and Ismailis), and 11 Christian faiths. 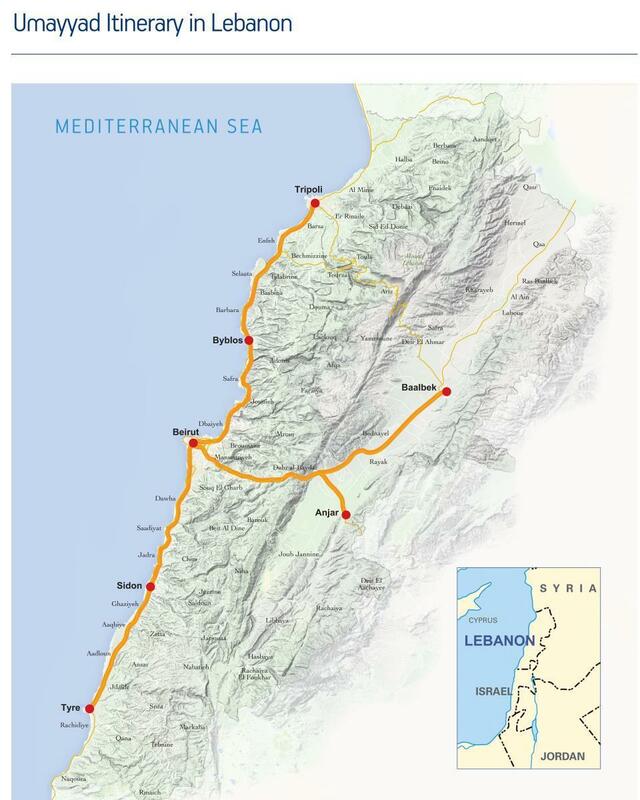 The Umayyad route in Lebanon is a journey through port cities that connected the eastern Mediterranean with the rest of the world. Coastal Lebanese cities had been the link between East and West from the second millennium BC. The archaeological and architectural remains in these cities attest to the succession of the civilizations that developed in the Mediterranean. They display the wealth of the cultural exchange in the Mediterranean from the Phoenicians’ first sailings to the European and North African shores to present. These coastal cities are supplemented by one of the Umayyad cities, which sprouted in the eastern Mediterranean in the first half of the seventh century. The route illustrates a wonderful and concise course in the history of civilizations, with direct and immediate comparison among all the architectural and cultural legacies of these civilizations. Among the various architectural remains, the urban fabrics of various periods still exist in various fragments, with pluralistic cultural traits that mark the many aspects of daily life in these cities, including food, relationship with the natural setting and the multitude of diverse landscapes.